We received a press release that is definitely worthy of repeating. 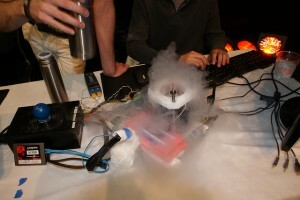 It seems Kingston Hyper X has gone hyper speed on some liquid nitrogen (LN2) at GamesCom 2010 in Cologne. Overclockers Benjamin Bioux (Benji Tshi) and Jean-Baptiste Gerard (marmott) went a little crazy and used nothing but some pink foam for a “pot” and reached what Kingston says is “the fastest ever recorded frequency for memory”. They used two sticks out of a tri-channel Kingston Hyper X DDR3-2333 kit along with a Gigabyte GA-P55A-UD4P and an i7 870. That setup reached an insane DDR3-3068! But wait, that’s not all…they did this at CL8!! Check out the CPUz Validation here. If you want, they even took a little video of it in action (and put it to music with a slide show thrown in). You can see some more photos of the session on Flickr and check out a full session summary with photos & screenshots at Xtreme Systems. Congratulations guys, and great clocking! Just yankin' yer crank Brolloks. What really impressed me about that wasn't the frequency, but was their tenacity in using FOAM for a pot! Yeah I was looking at that foam pot contraption, pretty clever if you ask me, do you know what voltage they charged through those sticks? They should be wearing gloves or they can get liquid nitrogen "burns". Temps of −196 °C; −321 °F are nothing to be spilling on skin. Been there done that. No fun at all.